Speaking at the EU leaders summit in Salzburg, Mrs May warned British investigators had uncovered 539 smuggling adverts on Facebook and other social media sites in 2017 alone, which have all been passed on to Interpol. 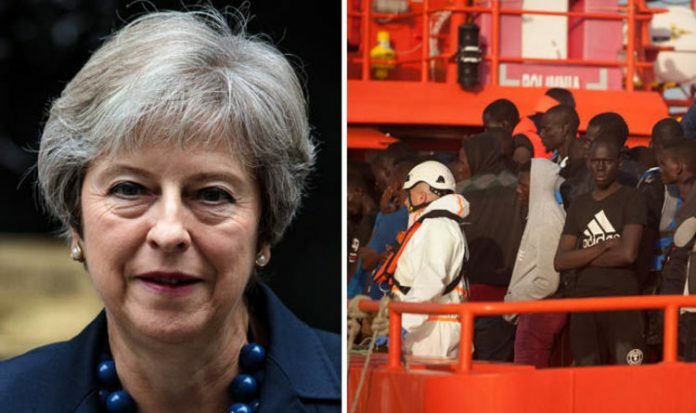 Commenting on the issue, the Prime Minister said: “It is too easy for traffickers and smugglers to a advertise their services online. She accused social media sites of failing to tackle the issue, and for allowing individuals openly advertising illegal transit services in “travel agent” style adverts to operate freely on their platforms. Mrs May argued this was allowing many vulnerable people, who believe they are paying for “safe, normal” travel to Europe, to face immense danger. This includes being tricked into believing they are paying for a boat fare to Europe, when in reality they are being transported in overcrowded dinghies. She also announced the UK is willing to share UK cyber-policing expertise with other EU member states, arguing “online platforms have no respect for borders”. The Prime Minister added if countries fail to work together, traffickers will be able to “exploit our weakest link”. Among her suggestions was an approach employed to tackle online extremist propaganda. The method includes working more closely with social media firms, and better facilitating Europol’s Internet Referral Unit to remove dangerous content immediately. European Council President Donald Tusk nevertheless called on EU leaders to “stop the migration blame game”. Referring to populist governments, including that in Italy and Ukraine, he called on EU leaders to stop taking political advantage of the migration crisis, and to work together to reach a solution. He said: “Instead of taking political advantage of the situation, we should focus on what works.